The world watched as Prince William looked into his longtime love's eyes, slipped a gold wedding band on her finger and made her his wife. The simple band is an understated complement to the royal bride's lavish engagement ring, almost hidden beside the large sapphire, like a private token of love and commitment meant for the couple alone. The royal couple's ring style choice brought plain gold wedding bands back into the spotlight. Discover the story behind Kate Middleton's wedding ring. For centuries, European royal brides wore elaborate betrothal rings as symbols of both an engagement and a marriage. Generally the bride wore only one ring and the groom did not wear any type of commitment ring. However, it was not until the early 20th century that royal couples began incorporating a second ring to serve as a wedding band in marriage ceremonies. Simple unadorned rings in gold or silver were common in some cultures, such as Jewish wedding jewelry and Russian wedding rings, for people of all walks of life since medieval times. The ring's continuous circular shape represented the eternal vow of marriage that connected two lives as one. The use of gold or silver as valuable metals paid tribute to the symbolism. Queen Elizabeth II's mother, Elizabeth Bowes-Lyon (aka the Queen Mother) was one of the first British royal brides to wear a plain gold wedding band when she married the future King George VI in 1923. The choice of a plain unadorned gold ring may have been a way of showing solidarity with all British people experiencing economic hardship during the Great Depression. However, the power of the symbolism of eternal love forged in precious metal requires no adornment to enhance its message. It was a perfect ring choice for the Queen Mother and King George VI, a known love match. British royal wedding rings follow a special tradition started by the Queen Mother in 1923. To mark the special ties between British royalty and Wales, King George VI had the Queen Mother's wedding ring designed in rare Welsh gold. The royal family obtained a large nugget of gold from the Clogau St. David's Gold Mine in Bontddu, North Wales, to make the Queen Mother's wedding ring. Royal jewelers used the same gold nugget to craft wedding rings for Queen Elizabeth II, Princess Margaret, Princess Anne and Princess Diana. After so many rings, little of the original nugget remained. However, the British Royal Legion gifted Queen Elizabeth with a second nugget of Welsh gold in the 1980s. From this second gold nugget, jewelers made wedding rings for the Duchess of York (Sarah Ferguson), the Earl and Countess of Wessex (Prince Edward and wife, Sophie) as well as for Prince Charles and Camilla, the Duchess of Cornwall. In 2010, Queen Elizabeth presented Prince William and Kate Middleton with gold from this nugget for the creation of Kate's wedding ring. Her Royal Highness the Duchess of Cambridge wears Welsh gold. On her wedding day, Kate Middleton became a princess and gained an official title - Her Royal Highness the Duchess of Cambridge. The future Princess of Wales now wears a Welsh gold wedding band that follows the British royal tradition. 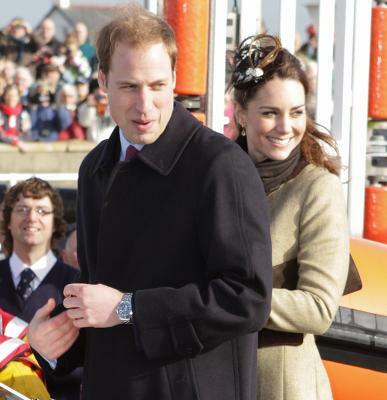 Prince William selected Wartski to design Kate's wedding ring. Wartski is a Welsh family-owned company that specializes in jewelry, art and antiques that was founded in 1865, and has close ties to the British royal family. The company is known for fine jewelry pieces that are works of art. European royalty, international celebrities and notable Americans, such as former First Lady Jacqueline Kennedy Onassis, have worn Wartski jewelry creations. 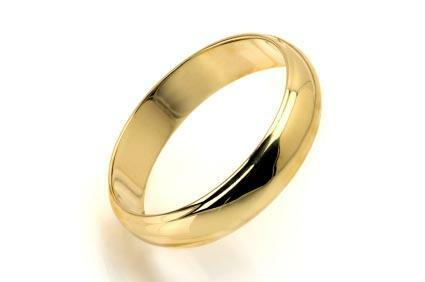 Kate's wedding ring is a slender, plain yellow gold band without any accessory stones or decorative elements. The simplicity of the band shows off the beauty of the Welsh gold, which is valued for its quality and rarity. The slender band also blends well with her 18 carat blue sapphire and diamond engagement ring and helps it stand out better. When an engagement ring features a large stone and an elaborate setting, it is best to pair it with a plain wedding band. Prince William gave his love two rings that have special meaning - his mom's engagement ring and a ring made with a gift of gold from his grandma. The engagement ring and wedding ring are true gifts of love that symbolize William welcoming Kate into his family.